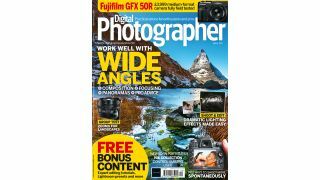 The new issue of Digital Photographer is now available. In this issue it's all about the bigger picture. Explore our cover feature, which is dedicated to wideangle photography. Here we examine the core benefits and challenges of working with wide lenses in the main genres of photography. Learn to compose your shots like a pro, work with accessories and pick the perfect optic, understanding how focal length and crop factors apply with your camera. Then take a step further as we explain how to break the conventions of working at the wide end, for images with a truly unique perspective. Next join Lee Frost as he explains how to shoot spontaneous masterpieces. Master your camera to streamline the shooting process, pick the best lenses and use locations, learning how to spot when potential subjects can be expected. Lee provides his insider tips to help you increase your 'hit' rate today. We all love our pets and what better way to celebrate this relationship than by creating beautiful portraits of them? Follow your guide Lauren Scott, a veteran writer for Digital Photographer, as she reveals the pro secrets to capturing characterful, intimate studies of pet behaviour. Plus we've got our regulars - interviews, reviews (our landscape zoom lens group test is a must read), shooting tutorials and career guides.